3. Minutes of the last meeting were agreed and signed. Planting trees ongoing. It was discussed whether to contact local firms for JCB to dig out scrape. The contractors working for Severn Trent had moved away. Dam leaking due to vandalism, needs repairing. Camera monitoring posts will be bought and placed around site at designated places. Long discussion on evergreen trees, some can be used to infill hedge along entrance road. Tree and shrub planting, coppicing to be left for winter. Butterfly monitoring. Reptile monitoring. Bio Blitz with breakfast was suggested (as with Heath week) in August. Bat box needs siting. Clearing walkways. 1. In attendance: Ann & Bryan Williams, Neil Graham, Elizabeth James, Heather Lloyd, Roy Davis, John Vidal, Mike Simms and Bill Jones. 4. Matters arising. Lots of positive feedback after the installation of the information boards. Ann reported that she had submitted the Tesco bags of Help final form. 5. Update on site. Mike has been meeting with Oswestry school on site and they have been completing several tasks. We had a good work day last Sunday. Some of the old Willow was removed and 20 Hazel and 10 Field Maple planted along wild life corridor. Ann had received a letter from Derek Jones asking for leaflet after reading Anns article in the Advertizer. He was raised in the village and is trying to organise a reunion at the school. Ringing Birch, Coppice Hazel, clearing Birch on Skylark mound, corrugated sheets to put around site for snakes, Moth traps, encouraging insects. Meet next Sat 23rd on site 11.00 Assess site where to put Camera posts. Minutes of meeting held on 9th October, 2018 at St.Martins Centre at 7.30 p.m. In attendance Ann & Bryan Williams, Roy Davis and Heather Lloyd. apologies from Neil Graham and Elizabeth James. Bryan had met Mike Ashton at Stans to pick up and pay £72 for laminating mining maps. Seating: - Neil was not in attendance to inform us of pricing. Lee informed us at the last workday that that Mike (Shropshire Council) is making a wooden bench for the Meadows without any nails. Roy felt that wood would be more appropriate than recycled material. Nature Fun Day - everyone agreed that this had been a success. The final report for 3 Parish/Big Local had been handed into Qube for Bridget today. Heather stated that a large quantity of metal poles where in the centres store rooms which no one has claimed. If they are any good to us we can have them. Might enable us to use the second marquee. Cattle at the Meadows: The front page of last week's Advertizer was discussed. This was sensational and incorrect. Since this appeared Ann had received a telephone call from a councillor stating that they would like to discuss the idea on site with Shaun and the Friends and not at Parish Council meeting as they had suggested. He did not want a shouting match. Ann then explained that she had not been approached by the Advertiser and she did not think that Shaun to give our side of things. She also reiterated that Ifton Meadows was a Local Nature Reserve and not a Park or Dog Toilet and if these cattle deterred some dog owners from using the site that would be a good thing, particularly if it was those who refuse to clean up after their dogs. It was agreed that the visit to Lyth Hill would be 28th October or 4th November both on a Sunday. These dates would suit Roy who works. Ann would ask Lee if one of these dates would suit the Friends of Lyth Hill. Workday - At Roy's suggestion it was decided to cut down some of the scrub trees on South side on Sunday and paint them with 'roundup' . Roy also suggested removing some of the Large Mast beech trees which cast hundreds of seeds. Ann would source Roundup for Sunday. Ann asked Roy if he would take over the survey material handed in by Camilla - he agreed to this and said he wanted to do more surveying. He then suggested that we erect Posts at certain points throughout the site. These would all be the same height and need to be somewhere a camera could be rested on to take a photograph. Then we could see the change during the season of each area. - This is already being done on a National level. Following on from our Nature Fun Day - Roy thought we should have something either annually or bi- annual and should include a Dog Show. We should look out for someone who would be prepared to organise this independently from us and it would run alongside our Nature day. 11th September, 2018 7.30 p.m. In attendance, Anne & Bryan Williams, Neil Graham , Elizabeth James. Camilla Olah has decided to resign her post due to prolonged heath issues. She attended to hand over all items belonging to IMMC. She still wish's to have minutes and to be included in any social meetings. We shall all miss Camilla and thank her for her work over the years. Minutes were agreed and signed. 1- Interpretation boards these have been signed off and are being sent to be manufactured. 2 - Seating was again discussed Neil would look into the price of seats using recycled material one with a back and four without backs. Neil then agreed to approach St.Martins, Gobowen, Western Rhyn and Chirk Parish councils to see if they would each sponsor a chair to mark the 50th Anniversary of the closure of Ifton Colliery. 3 - Nature Fun Day : we could have done with more people but those that did attend have stated that they enjoyed the day. 20 bug boxes were made (all that had been prepared). Ann asked how many people attended( she need the number to complete the form for 'The 3 Parish Big Lottery Grant). It was decided that it was at least 200 over the day. 4 - Both at the Nature Fun day and at the workday last Sunday, Lee had spoken to us about having cattle on the site. He says that there will be no more than 6 Dexter's at any one time. These cattle eat young brambles and scrub without any problem and will tolerate dogs. Friends of Lyth Hill also had reservations when they were introduced there but are now happy and have no problems. Lee also suggested a visit to Lyth Hill and required dates to arrange a visit and to meet members of the Friends. Due to holidays and absence of other members it was decided to wait until late October. Neil stated he will be away until the 23rd, he also said that his primary concern is the fencing. 2- lots of frogs, mice and grass hoppers about when we were cutting the two events fields. 3-if anyone would like to be involved there will be a survey on 19th September at Ifton Meadows by the Invertebrates Society starting at 10.30 a.m.
4 - We have been invited to attend the Unveiling of the Miners Statue on 24th November and also put on a display. Neil informed us that he had been asked to carry the Miners Banner. The day will start with a service at the church at 11 a.m. followed by a march led by Ifton Colliery Band to the Memorial gardens for the unveiling (approx 12.15) and then onto the Miners Institute for Soup and Hot drinks (bar will also be open). Afterwards a play by Morton School will be performed and St.Martins School Choir will sing. Followed in the evening with a concert by the Dyffryn Ceiriog Male Voice Choir. Finally Ann asked if anyone had any expenses to claim as our accounts finish at the end of September. Minutes of 10th July 2018 meeting at St.Martins C. Centre 7.30 p.m. In attendance: Bryan and Ann Williams, Elizabeth James, Roy Davis and Neil Graham. Apologies from Camilla Olah. Other groups invited to this meeting but no one turned up. 1 - Vandalism -Copy of letter sent to the Police Station at Shrewsbury was read out - No response so far. Copies also sent to St. Martins Parish Council and Cllr Steve Davenport. 2 - Tables/chairs - Ellesmere Road Chapel have agreed to lend us their tables but ask that we take care because they are becoming fragile. Steve Davenport was asked about the Centres tables and chairs - said he would look into it. 3 - Stalls we now have 2 extra stall holders - Dave Hayes and St.Martins Allotment Society. Dave as also agreed to help with erecting marquee. Ann read out email from the later stating that they will have a Questions and Answers table. This has been included on new posters which she had made on yellow card to attract attention. 4 - Insurance - Elizabeth agreed to take the form into Coversure. She was handed the form and the cheque book. Risk assessment being worked out. 5 - No one had heard if Heather had been into the School with flier. 6 - Advertising - Ann asked if we should pay for an advert in the local papers. It was decided that a Press Release would be good enough. Neil also suggested informing Saturday morning show on Radio Shropshire which announces events on the day. They need two week's notice. Need to check which DJ. Roy suggested that we make a scarecrow and ask Stan's if we can put it outside their door with a poster on stating it is 2 weeks away, then one week, then today. Everyone thought this was a good idea. Need to ask Stan's if this is OK.
7 - Make a date to get marquee out and make sure everything is OK. Roy would get back when he is available possible week 23rd July. He also thought that we should have a day making a scarecrow. CONFIRMED 26th JULY at 11 a.m.
8 - check with OOZO toilets near the date and make sure they still have Neil's telephone number so that he can open the gate. 10 a.m. - At Ifton Meadows. - we have 5 offers of help erecting marquee. NEED MORE!! 11 a.m. - All Gazebo's etc to be on site by this time. 12 - 1 p.m. - Scarecrows to be put in place all must be on site by 1 p.m.
2 p.m. - 2nd session of Storyteller - Haulwen Nicholas. 1 - Email received from Sue Schofield regarding their Commemorative Statue unveiling on 24th November, 2018 this was read out it asked if we would put on a display of mining information. This was agreed and would be discussed fully in our September meeting once our nature Fun Day is over. Sue would be informed. 2 - Shiela Baines still not happy about the problem trees - Ann explained that she had been copied on to an email sent to Sian and Pete asking them to look into it. It appears no one as informed Sheila. 3 - Neil will visit Shaun tomorrow (11th) to discuss the site and in particular the Horse Field. Ary has offered to cut half the field ready for the event. We do not want Heavy machines in who just dump waste. Last time it was dumped in a ditch that we had dug out. Neil also said he would speak to 'Eric' who has a small baler about cutting and baling on site. 4 - It was decided that as our meeting falls on the 14th August the Tuesday before our event we can finalise everything then without the need for an extra meeting. 5 - Neil gave a quick report on flora/fauna on Ifton Meadows LNR - lot of different butterflies around at the moment but to quick to be photographed or identified. Also large hawker dragonflies. He also stated that someone was working on site cutting down trees near Swans pool. 6 - Roy stated that he had looked on line at D.I.Y. wildlife cameras mentioned last month on Springwatch but he felt that it would be better to buy a cheap wildlife camera - prices on line are around £40 plus batteries and sim card. It was agreed that this was the way to go forward and Neil volunteered to look on line. Discussion followed re: Nature Fun Day on 19th August. 2 -Brownies will do other refreshments ie: drinks and cakes. 10- 3 Parish Big Lottery? 11 - Orchardfield Ecological -Sian & Pete two tables required. tables and chairs required Ann to ask Centre (Steve Davenport) and Chapel (Sue Heard) if we can use there's. Minimum 13 tables - chairs as many as we can get. Neil said to make sure to ask Centre for the folding chairs on the trolley - better on grass and easier to transport. We should also ask the allotment society if they would like to come along. On the day - meet at Centre to pick up the Marquee 9.30 a.m. (need to get marquee out of shed and checked during 1st week of August). All stalls/gazebo's to be on site for 11 a.m.
Open 12 noon - All Scarecrows on site by 1p.m. judging 2 p.m. (Sian and Pete have agreed be judges). Bryan suggested that if it is wet we ask Sheila if we can put marquee in one of her greenhouses to dry. With problems on site it was thought this was a good idea. All stall holders will be invited to July meeting. skylarks - more nesting this year - better grass coverage helped. Minutes of 12th June 2018 meeting at St. Martins C. Centre 7.30 p.m. In attendance: Bryan and Ann Williams, Camilla Olah, Roy Davis and Neil Graham. New leaflet launch at Tesco's on 25th May went well , Ann, Bryan and Elizabeth James attended. Ann and Bryan met Mike Ashton from MA Creative at Stan's cafe on 30th May and picked up the Large Colliery Maps that had been laminated and to hand over the cheque for £72 (invoice already received)these were on the table for members to see. It was agreed to have the other six smaller underground levels maps laminated on both sides. Vandalism at Meadows - It was agreed that we should make a formal complaint to the police. We have had two picnic tables/bench's destroyed, they have also started on both the bench half way up the path to the mosaic and also the new WI bench. Also removed or damaged posts and several signs. In the letter it must be stressed that all these events are pre meditated - they are bringing tools with them. Neil stated that it happens between 4 and 6 p.m. (between the time he takes his dog in the afternoon and then again in early evening). Shaun to be asked for cost of his two bench's. It was suggested that we make enquiries regarding a D.I.Y camera as shown on BBC Country file. Roy and Bryan said they would check the website. At the last meeting we talked about asking the 3 Parish Councils if they would each like to put a seat on site to mark the 50th anniversary of the closure of the colliery. It was decided that due to the vandalism we would put this on hold for the time being. Neil suggested that we take our leaflets to the Plant and Craft event at the Institute and publicise our event. Ann reported that she had received confirmation from 3 Parish Big Lottery agreeing to give us £500 grant that we applied for. All the Nature Fun Day expenses are now cover. 1 -Steve Davenport has agreed to do a barbeque. Present: Ann & Bryan Williams, Neil Graham, Camilla Olah, Elizabeth James , Heather Lloyd and Bill Jones. Minutes read, agreed and signed. Leaflet launch - Tesco's have agreed that we can launching our leaflet at their Ellesmere store on Friday 25th May. It was agreed that this should be between 11 and 1 p.m. Bill agreed to attend. Camilla suggested that we take our banner. Tesco's - Bags of help grant helped fund this. Press release will be sent. It was also suggested that a week before our Nature Day we ask Stans Superstore if we can hand out leaflets and promote our event. Further promotion was suggested at the Table top sale at' Stute' on 9th June, (Neil would make enquiries about booking a table) and also at the 3 Parish event at the School on 7th July. A rough poster for the Nature Fun Day was shown advertising the Scarecrow competition and that there would be three money prizes - 1st £20, 2nd £10 and 3rd - £5 - One scarecrow per family - it was agreed to use this draft, adding the addition information : contact telephone number, who will be there on the day Paul Silver - The Silverman (booked), Fizz Gigs and The Gracechurch Georgian Dancers, (booked), Haulwen Nicholas - storyteller (booked) etc., Time changed to 12 -4 p.m. We would also drop the barbeque. Posters must go out quickly to let everyone know. No word regarding contact for the school - Heather then stated that she would go into the school for us - needs 100 plus A5 fliers. Volunteers needed to erect Marquee and for other jobs on the day. We also need to encourage groups and individuals to join us on the day. Email would be sent around. People like stalls to spend their money on. Confirmation received from Brownies (refreshments), Polly - 3 Parish wildlife group, Ifton Commemorative Group, Lee from Shropshire Council and ourselves (Tombola). Public Liability Insurance to be arrange but stall holders must sign a waiver of liability on the day. £118 for 2 million for up to 250 people. We have received confirmation that the Parish Council have awarded us the £500 grant that we applied for. Ann informed us that Shropshire Council have agreed to pay for Sian & Pete (Orchardfield Ecological Contractors))and also for the material for the bird boxes. So she will not be applying to Star Housing for a grant. Awaiting result of our application to 3 Parish Big Local. 1 - Ann & Bryan met Caroline Wix (3 Parish - volunteer co-ordinator) at Stans and we have since put on the Volunteers page, adverts for Friends of Ifton Meadows members, Conservation volunteers, Youth Engagement Volunteer and Wildlife Survey volunteers. Ann will send in another advert for volunteers to help erect Marque etc., for Nature Day on Sunday 19th August. 2 - Information Boards - Ann handed over to Neil several photographs which she needed electronically, she also needs the small photograph of the colliery. If this is not suitable for reproduction a sketch of it would be needed. It was suggested that this should be in Black and White. 3 - Mosiac - footprints - Neil explained that if you stand in them you can see where the following collieries used to be. 1 - Brynkinalt, 2 - Pen y banc, 3 - Black Park and 4 - Ifton. 4 - Trees - Bill would like to see some fruit trees on site. 5 - WI seat made of recycled material as gone down well and it was suggested that we have more. Neil suggested asking the 3 Parish Councils if they would like to place one each on site to mark 50th anniversary. Three X's were placed on a map to mark where we would like them. Neil agreed to check on price and types. He thinks that you can get them in various shapes including like logs. 6 - Skylark signs need replacing - Ann gave Neil new signs. 7 - Further complaint from Sheila (Pentre Nurseries) the boundary trees have still not be cut back. Minutes of IMMC meeting on 10th April, 2018 at St.Martins Centre. Apologise from Camilla Olah and Bill Jones. We were expecting representatives from some of the other groups that showed an interested and attended February meeting but unfortunately they did not arrive. The new Leaflet was handed around: everyone approved. Discussion took place whether or not to launch the new logo and leaflet before the Identification boards are ready. Ann would speak to Shaun. Everyone did agree that any launch should be either at the Meadows or at the Centre. 7 planks would be need to make 21 boxes (3 boxes per plank) rough price £3.50 per plank plus vat. Ann reported that she had booked a disabled toilet at cost of £98. Also Sian Edwards - Nature ID person for £120. She would be asked to talk/ID mini bugs in water , soil and butterfly net forage. Paul Thorpe/The Silverman is proving elusive - no reply from email, text and phone call. Hopefully he will be in touch shortly. Insurance was discussed and the form examined. This is ongoing we need to decided on how much cover we require. Barbeque - Ann would get in touch with Steve Davenport to find out if he is still doing barbeques and how much he would cost. Brownies have volunteered to do tea/coffee and cake -refreshments. Music - nothing yet regarding musicians mentioned in March meeting, Whizz Gigs were mentioned from Ellesmere, enquiries would be made via Mary Lowery. At Sunday's workday, Lee said he would look into Gio Cache (it seems that Council have these). We need to try and get the school etc involved to bring in more people. A suggestion was made to have a Family Scarecrow competition - this would be looked into. Ann will be meeting Bridget from 3 Parish Big Lottery next week with regard to completing a grant application for £500 towards the event. It was suggested that we ask the Parish Council for a grant - £500. This needs to be in before the May meeting. Rough posters need to be made and put around to let everyone know what we are arranging. The scrape was extended by Lee, Roy and Bryan while Ann cut brambles from around the trees that were planted last Spring. We then moved on to top of Prices Dingle and dug out a section of silt. We were very pleased to find a frog and some frogspawn which was starting to break down, allowing the tadpoles to escape. A small portion of this spawn was removed and taken across to the new scrape. New notices need to be made and put on the skylark posts. IMMC meeting on 13th March, 2017 at St.Martins Centre. Attending: Ann and Bryan Williams, Bill Jones. Roy Davis, Neil Graham and Elizabeth James. Minutes handed out and agreed. Ann handed out copies of the first draft of the new leaflet .Liked by all present. Amendments: Horse field and Railway field should be in the same colour. Outer border of site should be more defined. Ann to ask for Prices. Large mining maps have been laminated and would need to be collected and paid for. Discussion then took place regarding Fun day on Sunday 19th August. Rough costs: £1000. Need to apply for grants from 3 Parish Big Lottery and Parish council.Roy stated that he had made enquiries re: wood for bird boxes and you could get 3 boxes from 150ml x 25ml deep lengths of wood. wood plus extras would cost £50 ?? Ann stated that Sian was prepared to come along and would cost £120 per the day. No reply yet from The Silver Man'(entertainer). Enquiries would be made re cost of insurance and toilets. Neil suggested music might be provided by an Oswestry Group based at one of the chapels. He would make enquiries. Roy suggested making a maze on the horse field for people to us. Neil suggested planting a Willow tunnel in the wet patch on Horse field for children to play in. Proposed seat to mark St.Martins WI's 90th Anniversary to be placed at the view point - the meeting agreed to let this go ahead. This meeting had been called to find out if groups in the village would support and take part in a event to mark the 40th anniversary of Ifton Meadows. our committee would like to know possible dates for the event and ideas for activities to take place on the day. Table top sale - all groups and individuals could be invited to take part. Tree identification - drawings of the outline of leaves and children have to go out and find them. Bird boxes - pre-cut and drilled parts and have kids assemble them. Water bugs - if possible as Shan did. Themes - question was asked about having a theme for the day and possibly dressing accordingly. Music - A band or group, country, line dancing, folk music. Maypole - we still have it so could be used. Everyone was thanked for taking part and asked to contact Ann Williams or Neil Graham if they thought of anything else and were invited to our April meeting to finalise arrangements. Apologise from Camilla Olah, Bryan Williams. No Minutes available for November. December we had our Christmas Meal at White Lion, Whittington which was enjoyed by members and friends. 2018 is the 40th Anniversary of Ifton Meadows being made a green space and also the 50th Anniversary of the closure of Ifton Colliery. It was decided that we would concentrate on our 40th Anniversary. The feeling was that has there is already a community group arranging a 'statue' etc to mark the closure of the Colliery we would use our History interpretation board plus planting some trees in November to mark the event. 40th Anniversary would take place end of July/August and other groups and individuals would be encourage to join in (similar to our event in 2016). Invites would be sent around to join us at our February 13th meeting. Roy would get in touch with the scouts. Maypole, Nature Trail, Bird box and bee house making, Bouncy castle, fun and games , music etc., Storyteller (Ann would ask her daughter) Mary Lewery would also be approached regarding ideas. This is ongoing - Ann will be taking Camilla's folder to MA Creative at Shrewbury shortly. Neil, Bryan and Ann have also made an appointment with Flintshire Archives to check on Ifton Colliery files. Ann suggested instead of a picture of Ifton Colliery on the History board we could use a plan of the colliery . Neil started to draw layout of buildings on paper supplied by Ann. Lee suggested that we offer tea and cake to encourage volunteers. Sunday we need strimmer, rakes, shovels for brambles. Meeting of IMMC at St.Martins Centre on 10th October 2017 at 7.30 p.m. Apologies from Camilla Olaf and Bill. Minutes were read, agreed and signed. No farther in obtaining any goats for skylark mound. It was agreed that Shaun should be contacted about the fencing to see how it is progressing - fencing needs to be netted. Contact should be made with the Shropshire Smallholders Association. Report received that two baby hedgehogs have been seen recently on/alongside the lower pathway. 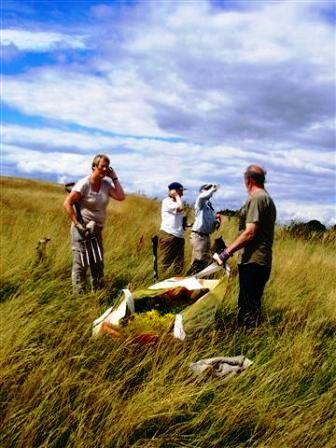 A group of 20 Tesco employees came on the Meadows on 19th September to help clear the saplings from the around the Skylark mound. Neil stated that some where more enthusiastic than others. Part of the Big Dee project. Elizabeth handed over a cheque for £15 from Pentre Nurseries from the Sale of books, this will be the last for this year - Elizabeth stated that she will be removing the books for the winter to stop them getting damp. Ann reported on the complete destruction of one of the picnic table/bench's, which has been removed to see if it can be repaired. The other set had been attacked but is usable. Pictures of the destruction can be seen on our 'Friends of Ifton Meadows' face book page. Regarding the Facebook page - Neil stated that he had sorted the pictures (which are numerous) into an album - Lot of pictures of fungi which are plentiful this year. Ann also reported on the guided tour that she gave Mike from MA Creative along with Bryan and Neil at Ifton Meadows on Monday 9th October. Mike wanted to get to know the site before he started on the Interpretation boards. One suggestion he made was that we have two small signs attached to the entrance at the bottom of the Dingle and onto the site by Pen y banc, welcoming people to the nature reserve. Ann then asked if we wished to mark the 50th Anniversary of the pit and the 40th anniversary of the site becoming a green space. A suggestion was put forward that we resurrect the Lantern parade for one year with paid help. To be discussed further. We have managed to attend workdays most months - work ranged from keeping open waterways at the pond, along with clearing the pathways and the Brownies Meadow. Recently we concentrated our work around the Colliery entrance, cutting back the hedge on the right hand side - right back to the hidden kerb and clearing the tarmac on the main pathway , this job is ongoing. We planted 12 large saplings in the Spring, 6 from the Parish Council which replaced three trees cut down in the village plus six we purchased . Bird Cherry and Crab Apple - we had to carry water to them over the following weeks. They are looking good and hopefully next year we will see some blossom. Several pairs of skylarks have been reported but we also had at least one nest destroyed by dogs -whose owners ignored the signs stating 'Keep Out - ground nesting birds. Hopefully Shaun will have fenced off the mound by next year. On Sunday we also found one of the picnic tables destroyed either by vandals or possibly a theft that had gone wrong - the other table had also been damaged this time they tried prising the nails out. On the plus side 20 Tesco workers came on the 19th September to help clear saplings from the left hand side of the main pathway to the mosaic. On Monday Bryan, Neil and I met Mike from MA Creative to give him a guided walk around the site - before he starts on the three interpretation boards we have ordered. Money for these comes from 'Tesco's bags of help' £1000 and money from Shaun's pot for use on the site. Thanks to Neil, Camilla, Elizabeth, Roy, Bryan and Bill, a new helper who is happy to get his hands dirty. Thanks also to Harry and his family for they also work on site. Our 'Friends of Ifton Meadows' page is going from strength to strength and many are putting photographs on, it is just a pity they are not interested in being hands on. We also this year managed a trip to Hunkington Nurseries, Walford where we enjoyed a talk by Viv Marsh on the 'Mason Bee' and how Shropshire is at the for front in surveying their numbers. We again must thank Pentre Nurseries and their customers for a £55 donation from the sale of second-hand books and Pant WI for their £20 donation for a guided walk around the site in August. Chairman of IMMC/Friends of Ifton Meadows. Present: Ann Williams, Neil Graham, Elizabeth James, Camilla Olah, Bryan Williams, Roy Davis. Shaun Burkey, Penny Wellman, Bill Jones. Circulation: Ann and Bryan Williams, Neil Graham, Elizabeth James, Camilla Olah, Shaun Burkey, Mark Blount, Steve Davenport, Colin and Margaret Chapman, Roy Davis, Dave and Joan Hayes, Hilary Richards, Claire Ford, Heather Lloyd, Jude Williams, Sue Worsfold, Polly Smith, Pierre Saunier, Sophie Hughes. Copy e-mailed to Sue Schofield for inclusion on the St. Martins website. Minutes. The minutes of the previous meeting were circulated and signed. Information Boards. Ann has received the money from the Tesco bags scheme. A further smaller meeting will be arranged with Shaun to allow us to progress towards making a firm order. Development Plan. Shaun introduced his assistant Penny Wellman and circulated copies of an aerial map of the Meadows showing the extent of the tree and shrub cover. He announced a workday using Tesco volunteer labour on September 19th and explained his plans for the management of the site, including increasing the numbers of volunteers. He confirmed the need to keep the Skylark Mound clear of scrub and discussed the management of the shrub areas around the site. He suggested that the shrub layer at the edge of woodland should be maintained by removing any trees that get above about 20 feet or 10years old. This would maintain a good habitat for a variety of wildlife. It was agreed that one or two well-shaped oak trees should be allowed to develop fully to provide mature trees in the future. Extensive discussion took place about the Skylark Mound. As some members of the public and their dogs have ignored repeated requests to keep off the area during the skylark breeding season the idea of fencing off the area is gaining hold. Shaun suggested that he might be able to get funding for a fence if a few cattle could be introduced in the wintertime to eat the excessive herbal growth. Neil was opposed to this on the grounds that the cattle might do more harm than good and suggested that goats might be more appropriate. Neil will look for information about local goats and report back to Shaun. Shaun announced that the trees that are encroaching on Pentre Nursery will soon be cut down but that the big trees by the Bungalow Entrance will need to be dealt with by a contractor. He also identified the need for discussion around monitoring and identification. It was pointed out that no hedgehogs have been seen on the Meadows lately. As hedgehog rescue are looking for places to re-introduce hedgehogs into the wild, Penny will investigate whether the Meadows would be considered a suitable location. Present: Ann Williams, Neil Graham, Elizabeth James, Camilla Olah, Bryan Williams. Minutes. The minutes of the previous meeting were read, agreed and signed. Green Gym. This was cancelled this month due to inclement weather. Hi viz jackets. Ann thanked Camilla for getting these organised. Bees. Following a link through the W.I. Ann has contacted Viv Marsh at Hunkington Nurseries. He is unable to give us a talk about bees at the moment but suggested a visit to his Nursery, where he specialises in plants that attract bees. Miners’ Memorial Meeting. Ann and Neil will attend this meeting at the Institute which concerns the 50th anniversary of the closing of Ifton Colliery, which will take place in 2018. New Trees. Six new trees have been ordered to help re-instate the hedge at the Colliery Entrance. Pond area. Following a meeting with Shaun Burkey last week, when he agreed that it was beneficial for trees on the south side of a pond to be kept in check, it was decided that we will go ahead and remove excess tree growth where appropriate. Information Boards. We looked through the box of information lent to us by Shaun and selected the pamphlet from the R. Alt Trail in Croxteth as being the one we liked best. We compared it to our own pamphlet and annotated the changes we would like to make. Ann and Camilla will work on a prototype with the aim being to provide visuals and commentary on both the natural history and the previous use of the site. These could be used to form the two sides of a new pamphlet and also enlarged to form the two information boards. Dog poo posters. We looked through the bag of posters designed by children at the school and handed on to Shaun. We selected 2 to display on the notice boards this month and will aim to change them regularly. Present: Ann Williams, Neil Graham, Camilla Olah, Bryan Williams, Roy Davis, Pierre Saunier, Sophie Hughes. Minutes. The minutes were read and agreed. Update. 60 children from Year 8 of St. Martins School visited the site on Monday 7th. Bryan reported on an accident to a dog involving loose barbed wire at the base of the gabions. He has removed the offending wire. Neil reported that he had uploaded pictures of the Dingle onto our facebook page. Also, he had accosted some young people who had been moving the picnic benches late one evening. Daffodils. It is now too late to plant them this year. We need to start earlier next year. Three Parishes Meeting. Neil and Sophie reported that this had been well attended. The next meeting will be in St. Martins. Jobs on the Meadows. At Sunday’s green gym both channels through the pond area were dug out, making them deeper and wider. The side pond was also deepened. A number of trees were identified which could be cleared to let in more sunlight. Neil will contact Shaun and confirm which trees should be modified. Next month we will work on either ditches or hedges, depending on the weather. Hi Viz Jackets. Camilla had searched the shed for our existing supply, but could only find two. Ann decided that we should get some more so that we have a dozen. Wheeled Strimmer. Ann had seen an advert for a wheeled strimmer, which would be useful for clearing paths. She will talk to Shaun about it. Christmas Meal. After due discussion and perusal of menus it was decided to go to the White Lion at Wittington. Ann will book for Tuesday 13th December at 7 for 7.30pm. Possible Improvements. It was suggested that a “Local Nature Reserve” notice could be placed at the colliery entrance. Sophie suggested the provision of a bird hide and various temporary structures were discussed. Lantern making materials. Mary Lewry had approached Ann about acquiring any of our leftover materials. We agreed to sell the paper. Present: Ann Williams, Neil Graham, Elizabeth James, Camilla Olah, Bryan Williams, Roy Davis, Polly Smith. Circulation: Ann and Bryan Williams, Neil Graham, Elizabeth James, Camilla Olah, Shaun Burkey, Mark Blount, Steve Davenport, Colin and Margaret Chapman, Roy Davis, Gareth Eggar, Dave and Joan Hayes, Hilary Richards, Claire Ford, Heather Lloyd, Sue Worsfold, Polly Smith. AGM. The Chairman’s report was distributed and approved. The Treasurer’s report was given and the accounts accepted. The election of officers followed. Three Parishes Community Wildlife Group. Polly Smith explained her promotion of the group, which would encompass all the wildlife areas in the parishes of St Martins, Weston Rhyn, Gobowen and also Selattyn. She hopes to encourage greater interest in our local wildlife and record it through monitoring across the area. She had worked on a similar scheme in the Clun area and has a number of contacts among naturalists. She distributed publicity for an inaugural meeting to be held at Weston Rhyn Institute on November 3rd at 7.00pm. Jobs on the Meadows. At the last green gym we worked on the ditch at the side of the main path, removing the saplings and clearing the drainage pipes. Jobs for the future include pond clearance, removing the trees from the reed bed, widening the lower pathway, trimming the layered hedge, clearing the scrub from the skylark mound, checking ditches, clearing the bramble cuttings and the grass mowings from the site and managing the trees in the birch field. It was suggested that the Scouts might be able to help with some of these. Spring Bulbs. Neil suggested planting more daffodil bulbs. Roy suggested a future event celebrating the show of snowdrops. Volunteer Jackets. We raised again the question of the Meadows hi-vis jackets. We decided that the wording should be MEADOWS VOLUNTEER. Camilla will get the jackets printed in black. It has been some time since we held any events and those have been in an evening i.e. Lantern Parades. So this was something different for us, a Nature/History day to mark the return of the 'Horse Field' to the site in April. This area will now be the events and picnic area - 2 picnic tables are already in place. Since April the field has been left as a meadow. This enabled monitoring of any flowers that might be growing in it. Cutting took place in September this allowing seeds to drop and self set for next year. The 'Party at the Meadows' on the 10th September started cloudy with a few spots of rain but by the afternoon the sun came out in all its glory and we had a lovely warm afternoon. At first we had difficulty with the jigsaws that where the gazebo's. If it is your own you know exactly how it fits together but otherwise it can cause a few problems. The Barbecue was busy as was the Brownies tea/cake stand. The Brownies also had a workshop making insect houses. St.Martins WI promoted themselves and the WI 'SOS for bees' campaign. Scouts had a coconut shy, The 3 Parish's Big Local gave away freebees and we supplied information of the History of the site and Ifton Colliery, along with Nature activities. The Bug sweeps with nets proved a very popular activity. We showed how to use nets to sweep the grass or trees then put the collected insects into magnifying boxes to identify. Lots of people had a go and found 10 different species including 7 spotted ladybirds and crickets. We even had Paul Silver (entertainer) on stilts with a net. Unfortunately, some groups did not come so we were down on stands but I hope everyone who did attend had a good day. How do you decide on how many people attended ? We had a slow start but after 2 p.m. there was a steady stream of people coming through so I would say 70 plus but that is only a guess. Our thanks to the 3 Parish Big Local for supporting this event with a grant towards the costs. Thanks must go to everyone who manned the stalls or came along to support this event. (If I have forgotten anyone please forgive me). Just in time for our event Shropshire Council removed the dog leg and bridle gate at the Colliery entrance and erected a new fence which gives us a few extra car parking places. Present: Ann Williams, Neil Graham, Elizabeth James, Camilla Olah, Bryan Williams, Roy Davis, Steve Davenport. Circulation: Ann and Bryan Williams, Neil Graham, Elizabeth James, Camilla Olah, Shaun Burkey, Mark Blount, Steve Davenport, Colin and Margaret Chapman, Roy Davis, Dave and Joan Hayes, Hilary Richards, Claire Ford, Heather Lloyd, Jude Williams, Sue Worsfold. The Future. Councillor Steve Davenport was able to allay our fears to some extent as it appears that Shropshire Council will want to maintain ultimate responsibility for the site and safeguard it for the future. However, Council responsibilities are still up in the air and there will be further discussions before the end of July. Clare and Corrie would like to attend an IMMC meeting and suggested July. As two members of the committee will be unable to attend at that point, further arrangements will have to be negotiated. Dog Fouling. Steve has contacted the Kingdom Company from Liverpool but has not yet had a response. Steve recommended that all the no-fouling signs in St Martins, both in the village and on the Meadows, should be of the same design. Tools. Following Shaun’s offer to supply tools, a list was begun. Loppers and secateurs were the most requested with thorn-proof gloves and saw blades also needed. LNR Accreditation. Ann has been in touch with Lorna Williams at Shropshire Council about incorporating the Railway Field and the Horse Field. She has passed the matter back to Shaun. Management Plan. It was agreed that the management plan needs reviewing and up-dating. We may need an extra meeting to achieve this. 10yr Celebration. Much discussion ensued about what to do and when to do it. It was agreed that any event should concentrate on Nature and the time of 1 – 5pm on Saturday 10th September was put forward. It was felt that gazeboes would be easier to manage than the big marquee. Ideas abounded, including a hog roast, dancers, maypole, games, stalls, orienteering, bouncy castle, face painting, ladybird lotto and wellie wanging. Toilets would need to be arranged and insurance investigated. The Horse Field. An initial assessment of the floral diversity of the area was undertaken at the green gym. It transpired that the western (ditch side) of the field is generally the wettest part, with patches of reeds growing, especially by the present site of the picnic tables. The eastern (orchard side) has the most flowers with ox-eye daisies, bird’s foot trefoil and some common orchids. Some of the trees cut down along the line of the former fence are starting to re-grow. Neil pointed out that the hedge by the road needs a major cut-back. Hi viz Jackets. Camilla is waiting for the Volunteer Ranger T-shirts to come from Shaun before getting the jackets printed with similar wording. Present: Ann Williams Neil Graham, Elizabeth James, Camilla Olah, Bryan Williams, Roy Davis, Shaun Burkey, Jude Williams, Sue Boyle. We were pleased that Shaun was able to attend the meeting which comprised a wide ranging discussion including the following topics. The Skylark Mound. Shaun justified his decision to mow the whole of the skylark mound last autumn. He explained that the grass had not been cut enough in the past and that we would look at it again in the summer and work out a regime for the future. The Path. Shaun has now arranged for further work to be done on spreading the new surface. Neil reported that some work had already started. The Scrape. The work was originally scheduled to be done by the Probation Trust but this proved unsatisfactory. Shaun has now arranged a contractor and we anticipate a satisfactory outcome. Communication. Neil asked if Shaun could copy to Ann details of further contracts for work on the Meadows, with a view to IMMC being on site to liaise if necessary. Dog Fouling. Shaun reported that the Kingdom Company from Liverpool have been having success in reducing the amount of dog fouling in Wrexham through the administration of fines. Ann will get in touch with them to see if a similar scheme would be suitable for the Meadows. LNR Accreditation. Shaun advised Ann to get in touch with Lorna Williams at Shropshire Council to update the official Ifton Meadows map so that it can be sent to Natural England, and the Horse Field and Railway Field can be fully incorporated into the LNR. Shaun suggested that IMMC might move towards Higher Level Stewardship. The Future. Shaun explained that he is fully stretched at the moment with a large number of sites to manage. He hopes that some of the smaller sites will soon come under the control of parish councils, which may give him more time to concentrate on the larger sites such as Ifton Meadows. The Horse Field. The work done by the Probation Trust at the main entrance end of the Horse Field was deplored. They were asked to remove the fence but overstepped their brief and removed all the trees and bushes as well. Neil asked if Shaun could provide new planting for this area and it was agreed that we would submit a list with a view to replanting in the autumn. Shaun spoke of the potential floral diversity of the Horse Field and suggested managing the area so that there are floral areas with grassy walkways around them. IMMC need to survey the field so that we can mark the areas of floral interest and then Shaun will send in a contractor to create the walkways. Bulbs, Tools etc. Shaun can get more wildflower bulbs if required and also has a number of tools available. He needs a list of our requirements. He also has a moth trap which we could borrow. Hi viz Jackets. Camilla reported that our existing jackets could be printed in Oswestry at a cost of about £2.00 each. Shaun offered to get us Volunteer Ranger T-shirts and the jackets could then be printed with similar wording. 10 Year Celebration. Ann suggested that we hold an event later in the summer to celebrate 10 years of the LNR. Activities could include an entertainer, dancers and a picnic. Green Gym. This month’s green gym focussed on the lower path and the butterfly scallops, together with more forceful notices for the Skylark Mound. Miscellaneous. Shaun suggested that we leave the birch field as it is for the moment. Ann reported that Reed bed by the Pen y banc gate is becoming overgrown and asked Shaun to have a look at it. Ann then showed Shaun some of our articles written for Village Life. He asked if they could be forwarded to him in the future so that he could distribute them more widely. The Committee send their best wishes to Neil for his ongoing recovery. Scrape and Path. The stone for the pathway has not been spread as the appointed work force apparently found the work heavier than expected and the degree of dog fouling made it unacceptable. A trial shallow trench has been dug for the scrape but it seems to be nearer the main path than anticipated. It is discouraging that these two long awaited projects have not yet been brought to fruition by Shropshire Council. The Future. We were pleased that Shropshire Councillor Steve Davenport attended the meeting. He said that the County’s parks and Ifton Meadows will probably maintain their current support. He will keep monitoring the situation and raise the profile of Ifton Meadows at upcoming meetings. He informed us that Shropshire Council have applied to the Government to be considered a special case for funding as the cut-backs are so severe that basic services are threatened. A meeting to further this request has been arranged for next month and Steve will keep us updated as to its outcome. Green Gym. As the sap is now rising in the birch trees, we transferred our efforts to the brambles in the Brownie Meadow. A concerted effort made a tremendous difference and we were pleased with the results. Miscellaneous. Ann displayed the red dots in the fungi book. This project has been more time consuming than anticipated. The daffodils by the entrance are now in flower. As we have no information about the timing of the work on the re-designed entrance and the access to the horse field we decided to leave the daffodils where they are for the time being. Similarly, the ladybird bingo and celebration of the solution to the horse field question cannot yet be carried forward. LNR Accreditation. We need the railway field and the horse field formally incorporated into the LNR. We look to Shropshire Council to expedite this now that the lease on the horse field has run out. Dog Fouling. The emotive subject of dog fouling was again discussed. Jude reported that in Wrexham a private company has been hired to catch offenders and has been issuing £70 fines to owners. She also spoke forcefully about the rudeness of some people on the Meadows when they are reminded of their obligations. Steve felt that we had been being too polite and should become more forceful. To this end it was agreed to investigate the replacement of the current notices with something more hard hitting and acquire wording to put on our high vis jackets to give us a badge of authority when on the Meadows. Camilla will investigate the practicality and costs of this. Steve will talk to Shaun about the possibility of extra bins for dog waste. In addition, we will put notices on the boards stating that fouling is illegal and will result in fines. We will add a reminder that from 6th April 2016 all dogs must be micro-chipped or the owner will face a £500 fine. Voluntary Hours. Ann announced that the voluntary hours added up to 429 last year. She will include this figure in her annual report to the Parish Council. Present: Ann Williams, Neil Graham, Camilla Olah, Bryan Williams, Sue Boyle Jude Williams. Circulation: Ann and Bryan Williams, Neil Graham, Elizabeth James, Camilla Olah, Shaun Burkey, Mark Blount, Steve Davenport, Colin and Margaret Chapman, Roy Davis, Gareth Eggar, Dave and Joan Hayes, Hilary Richards, Claire Ford, Heather Lloyd, Sue Worsfold. Copy e-mailed to Sue Schofield for inclusion on the St.Martins website. Minutes. The minutes of last month’s meeting were agreed and signed. Drainage Rods. These have now been purchased, as agreed. Scrape and Path. Work on these should have started this week but has been delayed due to the weather. The Future. Ann has written to Owen Paterson explaining our concerns. Shaun thinks that the cutbacks will not affect Ifton Meadows. Birch Trees. An article about birch trees has been submitted to Village Life. We will work on pruning them at the next green gym. Ladybird Bingo. Ann has further information about this scheme. It was agreed that it is a possible idea for a community activity in the summer. Red spots. Camilla provided these for use in recording identified species of fungi in our fungi book. Daffodils. The daffodils are not yet in evidence. We will watch for them coming through by the gate so that we can move them to a more appropriate site. Dog Fouling. Two members of the community came to the meeting to complain about dog fouling on the Meadows. This is a continuing problem. Not only is it unsightly and unpleasant, with unwanted effects on the soils but some residents are finding that their dogs are developing gastro-enteritis after walks on the Meadows. Neil suggested another poster campaign and Jude offered to confirm the facts with the vet who has been treating her dog. Jude will communicate her investigations to Ann who will draw up an A3 poster. Present: Neil Graham, Elizabeth James, Camilla Olah, Roy Davis. Minutes. The minutes of last month’s meeting were read and agreed. Green Gym. Our work in November to dig another channel through the pond area was well timed and there has been no flooding despite the persistent heavy rain. This month, while one group worked on the Pen-y-Banc hedge, others coppiced the growth on one side of the pond area. This will let more light in and reduce the amount of leaves falling into the water. Drainage Rods. Neil will follow up on this and buy some so that we can maintain the drainage pipes in the Dingle. The Scrape. Shaun has revived the plan to create a wetland scrape near the events area. The meeting was in support of the idea but were concerned about the precise location. Neil and Roy will assess the precise position and report to Shaun. Path to the Mosaic. Shaun has planned work to improve the path to the mosaic. A firmer, smoother path of well compressed material should make wheelchair and pushchair access more practicable. Horse Field. The lease on part of the field will end shortly and after April 1st the main part of the field will become incorporated into the Meadows. Shaun has got some picnic tables to go into it and plans for the fencing and gateway. Free Trees. The trees we were expecting from the parish Council have not yet materialised. Neil will follow it up. Wish List. If any money becomes availablewe would like to improve the colliery entrance and parking, establish a community orchard in the horse field and manage the birch trees in the Birch Field. Everything was going to plan. A superb team of volunteers turned up at 10am to help erect the marquees, the lanterns were being sorted, the wind and rain eased and the sun came out. Then disaster struck. A sudden gust of wind lifted the marquee, snapping one of the strops and pulling other pegs out of the ground, then smashed it all down into a frenzied heap of billowing canvas and bent poles. Swift action tamed the billowing canvas and team effort saved most of the lanterns, placing them into vehicles before the second marquee - still partly standing but with several bent poles – was grounded and dismantled for safety. Then began the long and dispiriting task of clearing up the mess and transporting everything back to the shelter of the Community Centre. At 2pm the team were able to disperse for a meal break and to start the publicity of cancellation of the event. An hour later the team reassembled for a couple of hours of cleaning and further sorting out, as well as placing notices around the village, and later, to check at the Colliery Entrance for anyone who may have missed the news of the cancellation. The 2013 Lantern Parade will be held on Saturday 2nd November. Free workshops' dates will be held at St Martins Centre on Saturday 26th and Wednesday 30th October. Workshops will run between 11am and 5pm . Since lanterns take at least one hour to make, the last start time of the day will be 4pm. We will need help both from our regular volunteers and hopefully some new ones. The nature reserve can be easily found by following the brown signs from the centre of the village. It is closely linked to the history of the village. click here to read more. and is supported by a group of local people. Known as the Friends of Ifton Meadows, this small group arrange events during the year, including The Lantern Parade. Green Gyms are held each month and are working sessions designed to maintain the site, its paths and habitats. The full calendar of tasks for 2013 Green Gyms can be seen here. Tasks 2013. . Anyone wishing to join us should meet at the Main Colliery Entrance at 1.30pm on the second Sunday of all months except December and January. A regular monthly meeting is held in St Martins Community Centre on the second Tuesday of each month except December. Guests are very welcome. Do you take pictures at Ifton Meadows and would you be happy to share them with others? Someone is always on the nature reserve. Your photographs could help us to find out what Flora and Fauna is on the site. Email them to iftonmeadows@btinternet.com (this is not checked every day so please be patient, we will reply.) with your name and date/month the picture was taken. This is so that we can credit you with the pictures and record them officially on the survey sheets. Present: Ann Williams, Neil Graham. Elizabeth James, Camilla Olah, Bryan Williams, Roy Davis . Pond. Water is continuing to flow well but silt is beginning to build up behind the rocks. Further work will be required when water levels eventually drop. Drainage rods. Neil has been looking on-line. It was decided that a middle range set of rods, priced at £20 – 30, with a bag, would be appropriate. The Scrape. Roy and Neil have had a look at the proposed site independently. Roy had drawn a sketch map of the suggested area and pointed out that the scrape would need to be 2 feet deep to prevent damage to wildlife by freezing. Neil reminded us that much of the events field was once hard standing. A site to the far side of the ditch would therefore be preferable, unless investigation proved that the old concrete pads had not extended to the back of the area. Ann will e-mail Shaun to get in touch with Neil. The Path. The stone for the path has not yet arrived and there are therefore no signs of the agreed improvement to the surface of the route to the mosaic. Ann will include a query about this in her e-mail to Shaun. Horse Field. A new gate has been installed from the section of the field which has been sold, into the road. This addresses our concerns that access to the said land could be across the public space, and was welcomed. The Future. With the current economic climate and the massive cut-backs in spending faced by Shropshire Council, concerns were raised as to our future support. Rumours are rife but it appears that nothing is yet settled. Roy voiced a number of concerns as to the way the situation is being handled and outlined a communication he intends to send to Steve Davenport. Ann will also write to Steve Davenport and Owen Paterson, outlining our concerns for the future of the Nature Reserve and its management. Birch Trees. Roy queried the management of the birch trees in the Birch Field. Previously we were advised that we should remove the less vigorous growth and leave a few mature trees. Roy felt that this would encourage even more saplings from the seeds of the mature specimens and suggested a system of ring-barking the larger trees. We will survey the trees in the field at the next green gym. Present: Ann Williams, Elizabeth James, Camilla Olah ,Bryan Williams, Roy Davis, Jude Williams, Steve Davenport. Circulation: Ann and Bryan Williams, Neil Graham, Elizabeth James, Camilla Olah, Shaun Burkey, Mark Blount, Steve Davenport, Colin and Margaret Chapman, Roy Davis, Dave and Joan Hayes, Hilary Richards, Claire Ford, Heather Lloyd, Jude Williams, Sue Worsfold.The Green Gym forward to November 6th. The minutes detailing arrangements for the Party on the Meadows were taken as read. Review of Event. The committee felt that the low key event went well. Particular praise was expressed for the entertainer Mr Silver, who held groups of children entranced. We were grateful for fine weather and the nature activities went well. The history boards attracted attention, some visitors being unaware that the Nature Reserve is on the site of an old mine. The re-alignment of the entrance provided improved parking. We were grateful for the generous financial contributions from the barbecue and the drinks stalls and the tombola proved popular. However, some of the expected groups did not attend. Outgoings included toilet hire, Mr Silver, insurance, prizes, room hire for planning meetings and donations for the table hire and first aid on site. Ann has put some photos on the website and Facebook. Jobs on the Meadows. Ann has identified a number of jobs for which we need help. These include widening the lower pathway, clearing ditches and drains, work on the pond and the reed bed and cutting back brambles. Also the horse field needs rolling. Scouts. The Scouts have expressed an interest in having a working week-end camp on the Meadows This would get some jobs done as well as involving local youth on the site. The ultimate decision will rest with Shaun Burkey. Shropshire Wildlife Trust. Ann has received the paperwork to join this group. However, we agreed that the financial ties are inappropriate for us, so Ann will withdraw our application. Present: Ann Williams, Elizabeth James, Camilla Olah, Bryan Williams, Roy Davis. Minutes. The minutes of the previous meeting were read and agreed. New Trees. Ann shared the press cuttings published following the press release about the new planting and Tesco’s bags for help. Information Boards. Ann went through the Tesco bags scheme which is now in operation in Ellesmere. We have not heard any more from M A Creative, but Ann will be in touch to inform him of our financial progress with the Tesco bags scheme. Bee-friendly planting. The visit to Hunkington Nurseries has been arranged for Friday 16th June at 11am. Green Gym. This will now be known as Work Day. At the next one we will be tackling the brambles on the Brownie Meadow. Management Plan. Shaun has asked for topics to be included in the next plan. Discussion was wide ranging and the following ideas were included. Mowing policy. Maintenance – boundary fences and stiles, boardwalks, main footpaths, gullies and ditches. Trees – safety and care, management of the birch, some felling of tall trees to the south of the pond area. Monitoring – additional help needed. New signage for the Skylark Mound. Re-establishment of the reed bed. Bat Walk. Ann will talk to Sue to suggest a suitable time. Tools. We need new loppers and secateurs and Roy suggested land blades. The minutes of the previous meeting were read and agreed. New Trees. We had hoped to plant the new trees this month but there was a problem with the order. We are now waiting for the potted trees to arrive. We decided to plant one or two in the Colliery Entrance hedge and the remaining four or five at the far end of the Horse Field, near the fence. We hope to be able to interplant them with hedging plants at a later date. Miners’ Memorial Meeting. Ann and Neil attended the meeting and were pleased to receive positive comments on the display boards of mining history. Information Boards. Ann and Camilla reported on their meeting to progress the project. The coloured map and selection of photographs were looked at and some of the commentary considered. Ann will investigate funding before we can progress to the next stage of technical advice. Dog poo posters. We hope that Neil will be able to put these in place as soon as he recovers from surgery. Ann reported on the complete destruction of one of the picnic table/bench's, which as been removed to see if it can be repaired. The other set had been attacked but is usable. Pictures of the destruction can be seen on our 'Friends of Ifton Meadows' face book page. Chairman Ann Williams read out her annual report (see attached) and thanked members for their support again this year. Financial report was then given, Income this year excluding £1000 grant from 'Tesco's bags of help fell slightly the deficit came out of our funds. Neil signed the account . Secretary - Camilla Olah proposed by Elizabeth James seconded by Ann Williams (Camilla absent due to ill health). Treasure - Elizabeth James agreed to stand but wished books to stay with Ann for next few months. Proposed by Neil Graham seconded by Roy Davis.